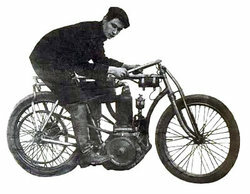 Maffeis (Fratelli Maffeis, later Enrico Torinelli) was believed to have built its first motorcycle in 1895 by Carletto Maffeis and Bernardo Maffeis. In 1903 the first motorcycle appeared named the Sarolea and had a 2hp engine. The Maffeis brothers then built a V-twin, in 1920, the Blackburne models had engines with 250 to 500cc, side-valve and a OHV. The company was in business until 1935.